One of the most iconic action stars of the past century is the one and only Charles Bronson. He has a charisma about him that is undeniable, so it’s no surprise that he’s a name still remembered to this day. The film that got him raised to such a status is a well known thriller called Death Wish. While controversial for its time, and even this time in a way, it has garnered a lot of fans and a possible remake from Eli Roth. Like with other films of this time and genre, one movie wasn’t enough, which resulted in a total of five Death Wish movies. What can be said about them? Well… they’re certainly something else. Let’s start with the original from 1974. Paul Kersey (Charles Bronson) is a liberal minded architect living with his wife (Hope Lange) and daughter (Kathleen Tolan) in New York City during a time when crime is sky rocketing. One afternoon, a group of thugs break into Paul’s apartment and assaults his daughter and murders his wife. Overcome with grief, Paul doesn’t know what to do and his beliefs are all starting to go down the drain. After a business trip, Paul comes home with the answer and a brand new revolver. He takes it upon himself to start working as a late night vigilante, walking the bad streets of New York and shooting anyone that threatens him or another person. This causes the media, citizens, and police to start paying attention to his actions, and things in New York begin to slightly change. With the people starting to fight for themselves, NYPD Lt. Frank Ochoa (Vincent Gardenia) begins his nearly impossible task of tracking down the vigilante and putting an end to his spree. Death Wish was made in 1974 and based off of a novel of the same name that was published in 1972. This was a time when crime was really getting bad in major cities, and people just didn’t know what to do about it. This brought about a new age of action films, with the most resonant being the Dirty Harry series. This film doesn’t quite hit as hard as some other films because the idea of vigilantism isn’t explored nearly enough. The novel takes the idea and shows the dark side that it can create, while the film shows Kersey as a straight up hero who can do no wrong. This makes the film feel incredibly dated and kind of a shallow experience, especially if you’re approaching this wanting to see an action classic that can stand the tests of time. It can also come off as very preachy in terms of its right wing political ideology. I don’t care if a movie leans a certain way, but make it subtle and don’t talk down to an audience. There are things in Death Wish that do stand out. 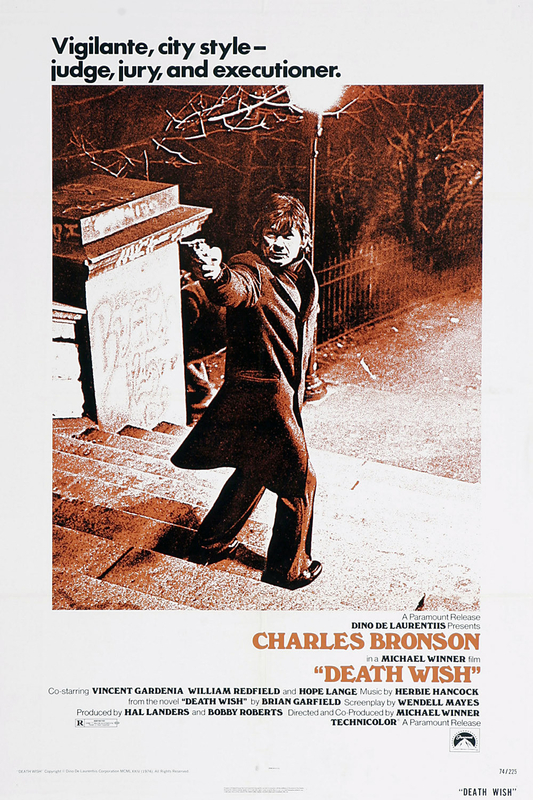 For one thing, Bronson’s performance is good even though the character sort of feels a little bit underdeveloped. Instead of being this boisterous vigilante, he plays the role very quietly, which actually reflects the whole tone of the movie. As the series goes on, it gets more and more off the walls, but this film is much more down to earth. In fact, it’s hard to call this movie a full blown action movie when it often times feels like a drama. The plot moves along slowly, which in retrospect actually works better than I originally thought. There are also no grand action set pieces. The “action” happens very quickly with Kersey pulling out his revolver and shooting a criminal, and once that’s done he just leaves the scene. It felt gritty and real and wasn’t at all what I originally expected this movie to be. Death Wish is an interesting time capsule of a movie, but it’s one that hasn’t really aged well. It’s political ideology is rammed down the audience’s throat to the point of being obnoxious and it features a well known main character that didn’t always feel too complete. It does feature some cool scenes that feel gritty and realistic and the whole approach of not making a grand scene of the violence is a good choice. I just wish that the idea of vigilantism and its dark side was explored more instead of the whole concept just being praised. It’s an interesting movie for any film history buff and fans of Charles Bronson, but it’s really lacking in many ways. Eight years later, in 1982, a sequel crept its way into theaters and dragged things down even further. After his vigilante spree in New York City, Paul Kersey has found a peaceful home in Los Angeles. His daughter (Robin Sherwood) is in a mental hospital and improving significantly, and he’s also found new love with radio reporter Geri Nichols (Jill Ireland). All of this comes crashing down when his daughter is kidnapped and murdered by a gang of criminals, which forces Kersey to once again pick up his revolver and hit the mean streets. As Kersey starts his revenge quest on the group of thugs, Detective Ochoa gets wind of what’s happening and travels to L.A. to put an end to Kersey’s spree, but it can never be that easy. Death Wish II is straight up garbage. There’s no use beating around the bush with this one. It doesn’t even try to be anything different than the original. Kersey is living a happy live, then someone he loves is killed which brings him to his vigilantism. That’s the same exact plot as the original Death Wish. At least that one raises some questions and presents the material in a subtle way. This one, however, is just violence for the sake of it without any interesting material to back it up. That would be acceptable if this film had any sense of style, but it doesn’t even have that. It’s just a gray, ugly looking movie filled with cannon fodder for Bronson to take his anger out on. It’s absolutely mindless and devoid of any sort of flash to pull the viewer in. Death Wish II succeeds at only the most base level. I will say that compared to the first one, there’s a bit more mindless entertainment. There’s no real set up to the movie. Things happen right away which leads Bronson to start his vengeful murder spree. If you want to see an action star just blow criminals away, this is the right movie to look at. There’s a lot more action and the violent scenes do feel bigger and more exciting, which is definitely a plus. The only problem, like I said before, is that there’s no style and the motivation feels completely stunted by Charles Bronson’s lack of dramatic presence. There’s really not much to say about Death Wish II. It feels like a rehashing of the first film, but more loud and more violent. This would be a welcome addition if the story felt different and something new was added. There’s really nothing new here at all. The only time there was a plot development that could lead somewhere interesting, the film makers decided to cut that off prematurely in favor of more mindless proceedings. This film is really a waste of time and only die hard Charles Bronson fans should give this movie any sort of respect. But the series wasn’t done with the stinker that is Death Wish II. Not by a long shot. In 1985, Death Wish 3 was released, and this is where things really started to go off the rails. Paul Kersey has been living the life of a vigilante for too long and has finally decided to put away the revolvers and lead a normal life. This personal promise to himself is shattered upon his return to New York City where he finds his long time friend bleeding to death after being attacked by a group of thugs in his apartment. Kersey is than approached by Inspector Shriker (Ed Lauter), who makes an off the records demand of Kersey to return to his old ways and clear the neighborhood of the goons responsible for all the mayhem. Kersey finds allies in the tenants of the apartment building, especially with WWII veteran Bennett Cross (Martin Balsam) and the mild mannered Rodriguez (Joseph Gonzalez). With the support of his neighbors and other victims of the community, Kersey wages war with the criminals and their leader, Fraker (Gavin O’Herlihy). 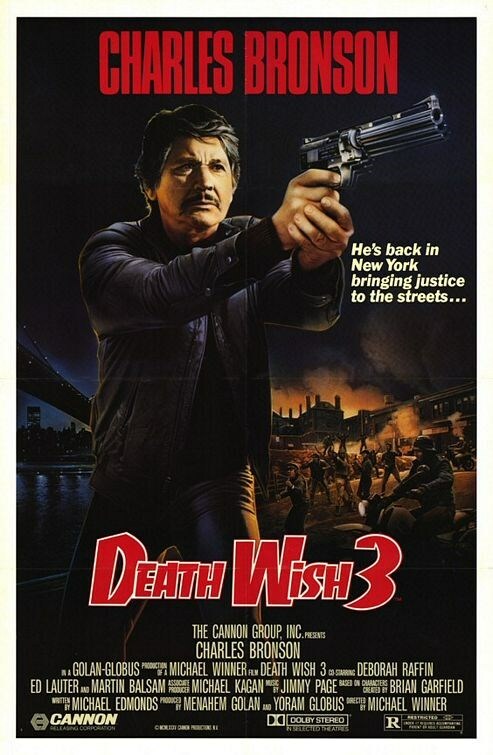 Death Wish 3 is one of the most unintentionally hilarious movies you or I may ever see. To be fair to it, it’s a slight step up from the second film but for some of the wrong reasons. I do like that the plot deviates from someone hurting his family, but it just goes right to someone hurting his friend. Where the movie really differs in that Kersey becomes something of a guardian angel to the neighborhood, and by the end they all join him in his war against Fraker and his goons. The third act of the movie, by the way, is an extended shoot out in the streets that seems to never end. It’s so much fun to watch but it’s some of the most absurd, mind numbing violence. By the end of it, there’s no emotion or excitement to be felt, other than the moment of joy when the first end credit begins to scroll up the screen. The rest of the movie is also devoid of any kind of emotional or dramatic impact, which would be fine if the rest of the movie was as entertaining and off the walls as the third act. It isn’t unfortunately, and this is where things really get bogged down. It does have more memorable characters than the previous film, but they don’t really have to much to say or do until things really start happening. There’s a few scenes of Kersey gunning down people throughout the movie, but it’s just all part of the formula by now. Even with a storyline that’s changed, it’s not enough. 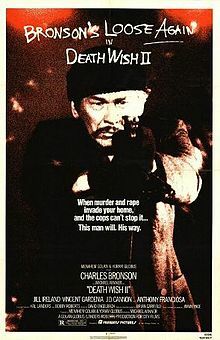 If you want a good laugh, Death Wish 3 might be worth checking out, if only for the outrageous finale. It still keeps up the same trend that the other ones did, so the whole routine is feeling kind of stale at this point. It is a step up from the second movie, but that’s hardly saying much. So that’s the first three films in the Death Wish series. I still have two more movies to go, so keep an eye out for the next part of this review.